Elon Musk stunned the business community at 12:48pm on August 7th, 2018. Tesla stock immediately surged 4.2% and the NASDAQ halted trading at 2:08pm. Exchange regulators wanted to determine if the story was real and if Musk had violated any Securities and Exchange Commission rules. Trading resumed at 3:45pm and the stock shot up another 3.2%. As of market close, Tesla finished up on the day by more than 10%. Short sellers and Tesla bears are crying foul. There is wide speculation that the tweet cannot be real, as the price "420" is a common long-standing marijuana joke. It's too early to tell, but if Musk's tweet was intended to manipulate the stock price then lawsuits are definitely on the horizon. After market close Tesla published an internal email that Musk sent out to Tesla employees. In the email Musk confirmed his tweet and intention to take Tesla private at $420 per share. He did not disclose any more information on the "funding secured" part of his tweet, and many financial analysts don't believe Musk really has secured the enormous funding that would be required. Going private would make things a lot easier on Musk. He wouldn't have to do quarterly earnings calls anymore or answer to shareholders in the same way a public company has to. Also, Musk alone cannot make this decision. He holds roughly 20% of the company. Tesla's bylaws have super-majority voting rules, which require at least two-thirds of shares to okay any major changes at Tesla. This includes board compensation changes, acquisitions, mergers, and taking the company private. These bylaws are how Elon Musk has stayed in control of Tesla, despite only owning 20% of the company. If the deal does happen, it will be the largest leveraged buyout in history, coming in at roughly $70 billion. But the shareholders, by a two-thirds majority, would have to approve it. More sinister minds have put forth other theories as to why Musk made his tweet on Tuesday. On December 1st Tesla has a debt payment of $920 million that matures. The tricky part, is if Tesla's stock price is below $360 on March 1, Tesla must immediately repay $920 million in debt – with cash. But if the stock price is above $360 bondholders can choose to be paid in Tesla stock, saving Tesla cash it desperately needs. Tesla burned through $2 billion in cash in 2017 and $1.8 billion so far in 2018. Tesla currently has $2.2 billion in cash as of the end of the June quarter. That sounds like a long time from now, but December 1st is less than 4 months away. Over the past year Tesla stock has been doing nothing and moving sideways. Excluding yesterday's stock spike, Tesla stock was at $341.99, down 1.4% on a rolling 12 month basis. Yesterday, after Musk's tweet, Tesla closed at $379.57. Some believe Musk is simply trying to bolster the stock price and get ahead of the $360 debt repayment triggering price. No details have yet been released on the funding Musk has secured, and there is no deal on the table at this time. Another theory is that Elon Musk is attacking the shorts. Tesla is a heavily shorted company. It's very common for Tesla to be the most shorted company in the stock market. The shorts have always been a thorn in Musk's side and he's been very upfront about not liking the "relentless attacks from short sellers." There are numerous financial blogs out there (each with a Tesla short bias) that claim what Elon Musk has done is securities fraud. They claim he's made this fake announcement just to drive the price of Tesla up, squeeze the short sellers and drive them out. I think Musk is a lot smarter than that. I have no idea how this is all going to play out. We'll just have to wait and see. The Wall Street Journal is reporting that the SEC has "made inquiries" concerning Elon Musk's tweet, specifically the "funding secured" portion. During Wednesday's trading day, no additional information was released by Tesla about the deal or the funding Musk had lined up. Tesla stock closed the day down at $370.34, which implies the market does not fully believe a deal will go through. SEC rule 14e-9 prohibits a publicly traded company from announcing a plan to buy or sell securities if they don't plan to follow through, don't have the means to complete the deal, or are only intending to manipulate the stock price. Former SEC Chairman Harvey Pitt told CNBC, "He is claiming there is a specific source of funding, so that had better be true. He has also claimed there is a specific amount available for funding. That has to be true." We'll continue to watch and see how this unfolds. Tesla stock continued to fall and closed the trading week at $355.49. The Tesla board is considering asking Elon Musk to recuse himself from further action regarding a possible leveraged buyout. The board wants to review the deal independent of Musk. No details have been released about the source of the funding or if there is enough funding to complete the buyout. The BBC is reporting a class action investor lawsuit has been filed against Elon. The suit alleges that Musk mislead the market with his Tweet and a short squeeze ensued. The lead plaintiff in the case is Kalman Isaacs and he alleges Elon's sole purpose in making his tweet was to destroy short sellers. A second and similar lawsuit has been filed by William Chamberlain. Mr. Chamberlain alleges Musk has violated federal securities law and attempted to artificially inflate Tesla's share price via his tweet. The New York times is reporting that when Elon Musk made his initial tweet about going private, it had not been cleared ahead of time with Tesla's board. Two sources have claimed the tweet was made with little forethought. Possibly in response to the pending lawsuits and public uproar, Musk made a blog post that has expanded on his initial comments. Musk is now citing the Saudi sovereign wealth fund as the source of his "funding secured" tweet. It was announced last week this very same fund raised their position in Tesla to 5%. But does this fund have enough capital to complete a leveraged buyout of Tesla on their own? It seems unlikely. Musk continues to meet with top investors in the company. The more investors he can convince to get inboard with the deal, the fewer in billions he needs to raise. There is still a large public outcry about the tweet, mostly coming from short sellers. They are pointing to Musk's long history of using Twitter against them. Shares of Tesla fluctuated throughout the day and ended trading slightly higher at $356.41. For now, it seems the market does not think Musk can complete this deal. The Securities and Exchange Commission is expanding its investigation to Tesla and Elon Musk. At the center of the investigation is Musk's "funding secured" statement. Charles Gasparino at Fox Business is reporting the SEC has sent subpoenas to Tesla regarding the privatization plan. Unnamed sources say Musk's "funding secured" statement and the overall plan itself are all being investigated by the SEC. Numerous news outlets are now reporting there is nothing substantive to Elon's desire to take Tesla private. Tesla's Board of Directors is in upheaval according to the New York Times. Some board members are begging Elon to stop tweeting. Other board members are alarmed by Musk's erratic behavior. The board had no prior knowledge of a Tesla privatization plan. Escalating matters, two more lawsuits have been filed bringing the total up to 4. The latest lawsuit alleges Musk fraudulently masterminded a scheme to artificially inflate the stock price of Tesla, all with the intention of getting back at short sellers. Tesla is currently trading at $336.80, down 3.12% on the day based on the SEC news. There are still two-and-a-half more hours in today's trading day. Tesla stock is cratering in morning trading. As of 11:00am EST the stock was down $26.75 (-7.97%) to $308.70. 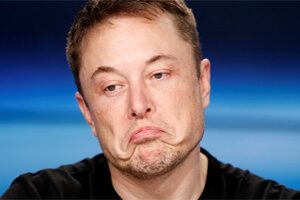 CNBC is reporting Tesla is looking aggressively for a new number-two, and there is speculation this person may take over for Elon Musk sooner rather than later. Musk did an interview yesterday with the New York Times and he was crying during most of it. He admitted to the Times that this year has taken a heavy toll on him personally. He further said he has been using Ambien to sleep and Tesla board members are becoming more and more concerned. In the interview Musk admitted that no one knew ahead of time about his tweet - he composed it and posted it on his own. He also admitted that the "funding secured" portion of his tweet was really potential investment by Saudi Arabia's government investment fund. The Saudi fund has not committed to a buyout or provide any cash at this time. No wonder the stock has been hit so hard this morning. Politics, government, and the way the world works are what I love to write about.